It's now been over 8 months since I moved to a small volcanic island in the middle of the Pacific Ocean...and it's crazy to think how many things have changed over this time period. For starters, my choice of wine (Big House Red boxed wine, if you're curious, a real bang for your buck and mouthwateringly delicious with anything from pasta to cheese to seared ahi), my wardrobe (from skinny jeans to high-waisted cut-offs, combat boots to Olukai's, flannel button-ups to...flannel button-ups), my rent (pretty high, but okay, this is my first time actually paying rent, since I'm fresh from the dorms of Notre Dame and the nomadic lifestyle I was living in South Africa wasn't conducive to making monthly payments), the sounds I hear outside of my window every night (not the Canadian geese and birdsong of North Idaho, or the cows and bakkies of rural South Africa, but the ocean waves of the Pacific crashing on the ruggedly beautiful, windy, unappreciated coastline of Waiehu)...and there's upwards of a million other things in my life that have changed as well. But none are as prominent or as worth mentioning as the fact that I can now (KIND OF) catch a (SMALL) wave on a (REALLY) long surfboard. Or, a longboard, I guess that's what they call it? Sure, I've tried surfing before. I hit the waves for the first time when I spent the summer after my freshman year of college in Orange County, California, driving from Laguna Beach to Corona del Mar to Newport to Huntington Beach and drooling over the surfer lifestyle (and, yeah, maybe the surfers themselves). I was a total wannabe. I donned a ridiculous amount of Rip Curl and Hurley and Billabong apparel and was stoked when a friend from college offered to take me and my roommate out surfing with his family. And then I figured something out. It was absolutely terrifying out there. I found out the hard way that these waves don't just magically help push you up and turn you into Kelly Slater at the snap of your fingers. Instead, they break like a roaring lion over your unsuspecting head, smash you in the face and shove water up your nose and mouth, rip your board away from you in the opposite direction, and pull you under until you're sure you're dead, deceased, gone...kind of like my older brother Michael used to do in the pool on family vacations (fine, he wasn't that cruel). At that point, I vowed that I would always just be an observer. A beach bum with a love of surfing movies. Content to watch the water from my hammock with coconut water in hand. The waves weren't for me. I'd just admire those who actually knew what they were doing. In 2012 I spent a semester abroad in Perth, Australia, during my junior year at Notre Dame. I had unexpectedly walked right into another surfer's paradise. After a few weeks of classes, I met a friendly Aussie who jumped at the chance to share his passion of being out in the water with me. We dealt with even bigger waves. Frick. Probably peed my wetsuit a couple of times. I'm not ashamed (it keeps you WARMER, duh). After a while, I just let him do the surfing. The waves were just too dog-gone huge! But luckily, my classmates and I were treated to a surf lesson in Margaret River at a much calmer, easier-to-learn-at spot. And...the lesson was followed by a wine tasting excursion. This made for a perfect day, because the waves were nice and small and the wine was...wine. Following that experience, I realized that surfing is an entirely different experience when you're just out there having fun with friends, picking and choosing from easy waves and not worrying for your life (except when you start wondering if that mysterious looking dark object out a few hundred yards is a Great White or a floating piece of seaweed). As many Perthians (is that a word?) and exchange students spending the semester in Western Australia will do, we hit the waters in Kuta, Bali on our spring break, renting boards on the beach for about $5 a day. I still had no idea what I was doing. I probably never caught a wave that hadn't already broken. There were still a few massive waves that pulled me under and took my breath away. But even following those slightly terrifying moments, I was starting to realize something pretty important. I was still paddling out. It is an interesting biological fact that all of us have, in our veins, the exact same percentage of salt in our blood that exists in the ocean, and therefore, we have salt in our blood, in our sweat, in our tears. We are tied to the ocean. And when we go back to the sea, whether is is to sail or to watch it - we are going back from whence we came. Enter 2015. And 2016. The setting: Maui. That little volcanic island with a whole lot of aloha spirit, a whole lot of palm trees and sun, and a whole lot of "island time." No rushing around. No worrying. 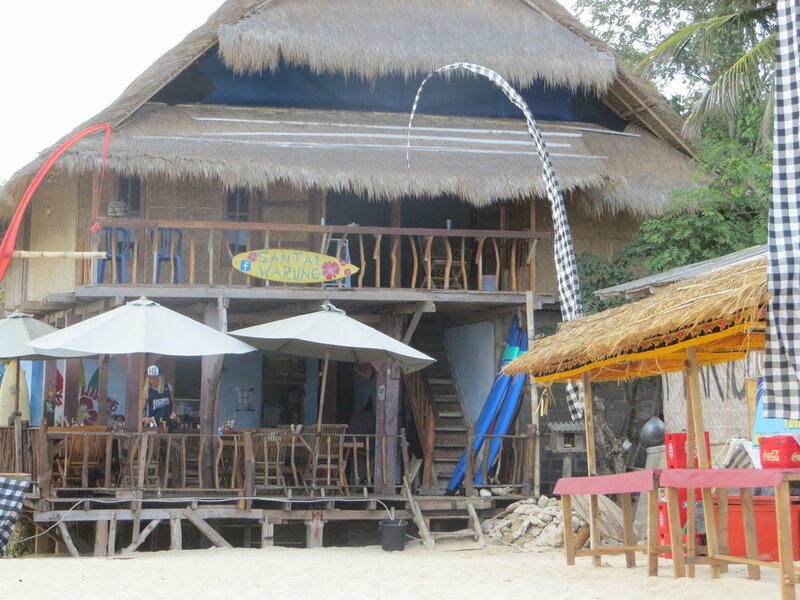 It's place where going surfing after work is synonymous with "hitting the gym" on the Mainland. It's the place where I bought my first Rip Curl shortie. The place where I started throwing the shaka out like an idiot every time a car let me turn in front of them. Where I started actually enjoying raw fish and fish tacos. And where a mask and snorkel became permanent residents of the trunk of my car, because, just in case. You never know when you'll be at beach and the conditions will be perfect for snorkeling. The first time I attempted to surf out here, I was a little buzzed on wine and life in general, amazed that I had just moved to an island. We were watching the sunset on the beach, and one of my new coworkers had a few extra boards. 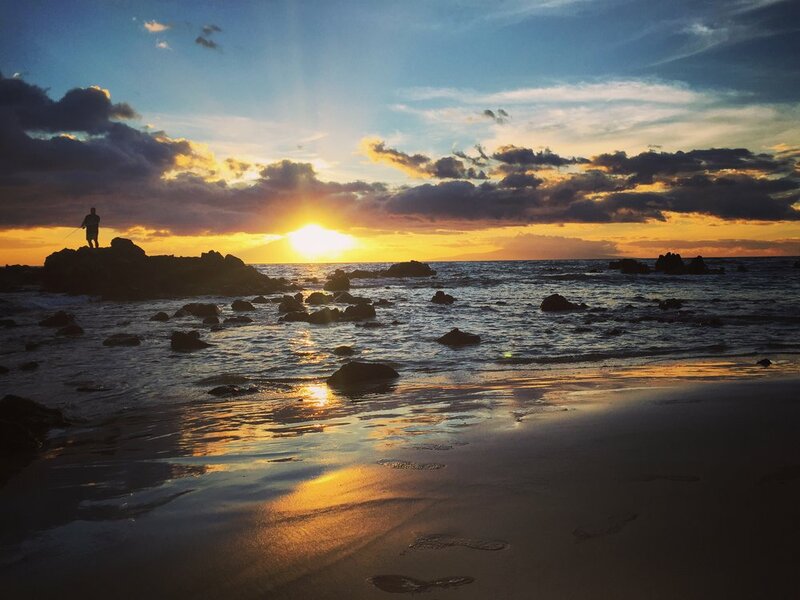 We paddled them out together and I just floated, watching my friends surf and relishing the warm water and the view of the West Maui's and the way the setting sun lit up the water around me. The meaning of paradise really sunk in. Over the last eight months, I've gone surfing several times, all over the island, at times solo and at times accompanied by my new friends. I'm still awful. I still won't go out if the waves are more than a few feet. I still love sitting in the sand watching the real athletes out there, but I no longer feeling inadequate, because my surfing high doesn't come from adrenaline rushes and battles with the double overhead beasts that break on Maui's north shore during the winter. My surfing high comes from the ache in my arms when I've been out paddling around for an hour. It comes from the warm water and sun and the splashy clunk sound my surfboard makes when it slaps the water as I paddle out. It comes from the smell of coconut-scented surfboard wax. It comes from hanging out with green sea turtles and waiting for waves while dangling my feet and legs over the sides of my board. My surfing high is a result of just being out on the ocean, being active, and every once in a while, catching a wave on my longboard and feeling that rush of accomplishment and the high they call surf stoke. 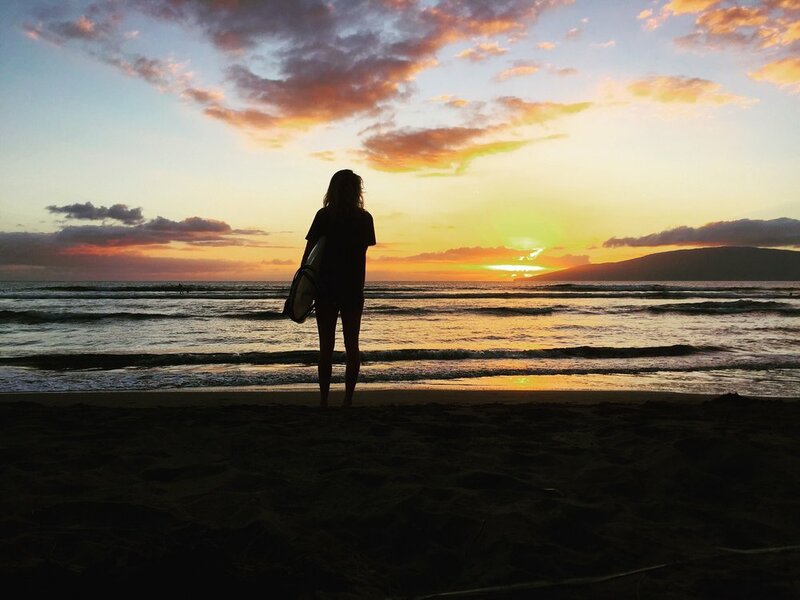 Maui has introduced me to a new kind of surfing, the chill after work type. Surrounded by families at the beach, tourists on soft-top board from Costco, little local keiki who have probably been surfing since they were in the womb, and other beginners like me. 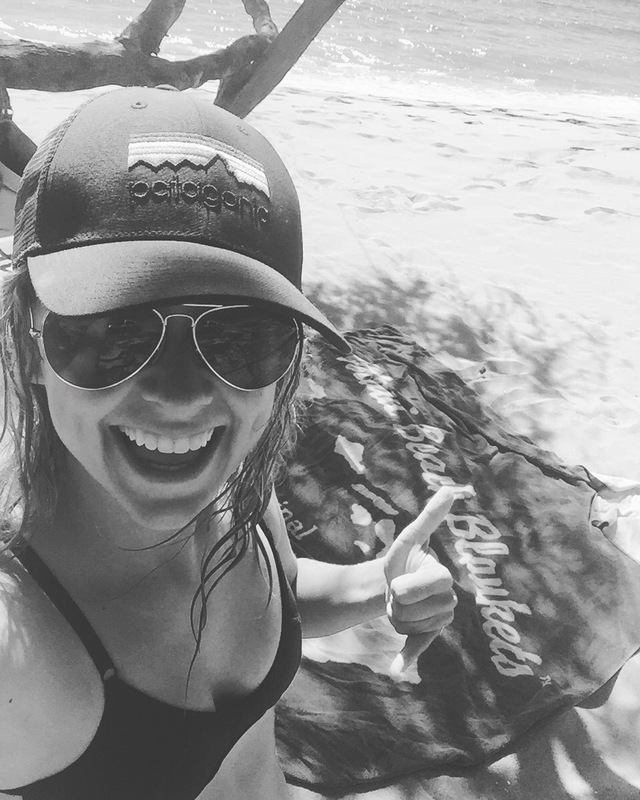 We're all just out there bobbing around on the waves, waiting for the next set of waves to roll in, smiling at each other like buffoons because we get to be out on the water and it's another beautiful day on Maui. We're all drawn together by one thing at those moments - the ocean. It's a magical feeling. And it will always will be. For now, I'll just keep paddling out in those small swells. I'll keep surfing on beat-up beginner boards. And I'll keep riding that surfer's high. Mahalo, Maui.